A couple of days back I was privileged to watch one of the best recent displays of classical Test Match batting by Rahul Dravid. That day (as so many times in the past too), Dravid secured a painstaking century on a minefield of a pitch to get India into a position of victory. He has done so earlier on similar pitches against much lethal bowling and in worse team situations. What is amazing is he was never directly focused on getting the runs. Runs seemed to be incidental outputs. His singular focus was to handle each ball as it comes, survive and score when possible – which in turn led to the century and eventually set up India’s victory. Dravid has been following that approach for the past 15 years, ball after ball, match after match, year after year – and it is no surprise that he is India’s second highest run getter in Tests. Well – this note is not about his achievements or why he remains my favorite Test batsman. This is about the approach he brings to batting. There is so much to learn for individual investors from the way Dravid bats. If only one thinks of oneself as Dravid, and everything around him as the markets – the pitch, the bowls coming down, the excitement, the team situation, one will realize the value of his approach and its application in the area of investing. 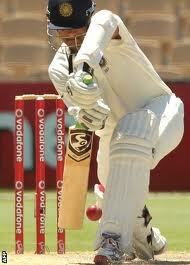 Dravid’s approach to batting is akin to Graham’s or perhaps even Buffett’s approach to investing . The first rule is never lose your wicket i.e. never lose money. The second rule is always follow the first rule. His expertise and experience in handling pitches like Sabina Park is tremendous, but he is still a student. He still does not know what exactly it has in store – i.e. which ball will seam and which will bounce, and does not try to pre-judge. Very much akin to the vagaries of the market which are futile to predict. His mind is almost trained with a plan for every over that sounds like – leave, leave, defend, leave, score, defend. His patience wears off the bowlers, so that they start bowling to where he wants them to. They try out-swingers which he leaves even if slightly off line, bouncers which he ducks without any ado, inswingers and short pitched balls which he gets behind and defends solidly. And finally he gets a wayward delivery on his legs which he flicks, or one that is wide outside the off stump which he drives. The entire process and journey by which he collects his runs and builds his innings is amazing, and more or less guaranteed to provide success if anyone could follow it well. Wickets keep falling and other batsmen score faster with boundaries from the other end, but when Dravid is at the crease, he is still thinking – leave, defend as his natural choices by default, and only if the ball is in his zone, he scores. And those opportunities surely come more often than not. When everyone around him is struggling – including the bowlers unable to comprehend what the ball will do next on this pitch, fielders bored with nothing seemingly happening, and non-strikers flashing their bats in a bid to do something – Dravid is patiently batting – in his zone. Isn’t the experience that normal individual investors have in the market similar to what batsmen face at pitches like Sabina Park most of the time? Sometimes you do have belters in big bull runs where you just get bat to ball, and it flies to the boundary. 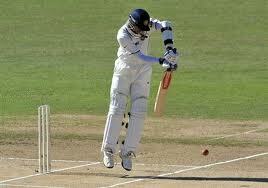 Investors that invest the way Dravid bats may temporarily look like fools on such belters. But most of the time, the markets are pitches like Sabina Park. You never know which way it will go. Defend or Leave is perhaps the best option for most individual investors on most deliveries thrown at them. Patience is then the biggest virtue, specially when you have a long innings to play. And when the market wears out and throws you a sitter, you grab it and accumulate your runs. If you do this ball after ball, match after match, year after year, through multiple economic cycles, good form or bad, a couple of things are sure. It is very unlikely that you will get out on a bad ball i.e. you are unlikely to suffer huge losses due to making bad investments. Most investors never recover or get back to markets after that. And finally, it is very likely that you will end up with a tally like Dravid’s by the time you are done.